I was asked to review this book [Disclaimer: Sent to me free in exchange for a post], recently published by Thinking Caps Tutoring founder Alexandra Mayzler and fellow author/tutor Ana McGann. I was excited first by the layout because I am a visual person and, regardless of how many years of education I tolerate or how academic I can act, I want my books to look interesting; yes I often judge books by their covers. But once I delved into the content of Tutor in a Book, I was also heartened - it's been an unfortunate reality that many so-called helpful books for students & parents are not only boring in their presentation but filled with uselessly vague nonsense like "Be sure to manage your time wisely!" 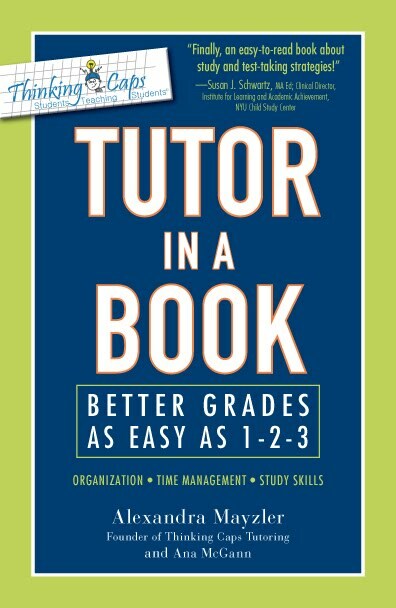 Tutor in a Book is brilliant from the beginning - its classy navy cover with a [color of geniuses] green border is appealing, the title font is simple yet vibrant, credentials are clear, and there is no picture of a sad failing kid (or an obnoxiously successful one). A glance at the table of contents gives a quick overview of the scope - five necessary parts (the first two are introductions for parents along with goal-setting tips, the middle three Organization, Time Management, and Study Skills, and the fifth a smart nod to the unfortunate but very real possibility of bombing out and having to start again), each divided into a few key topics. The tone of this book is immediately engaging. The authors know that most kids (and their parents) do not love talking about grades and all the hardship that goes into improving them, so they focus on the positive - both parties would prefer the same outcome (success in school) - and emphasize how to work as a team. To this end, there are brief examples of different learning styles as well as self-assessments to determine where students shine [I tagged those pages to copy for my students this year] and encouragement in identifying weaknesses - if we don't know what to improve, how can we begin? In addition, there are numerous tips aimed not just at what kids need to do but what their parents should also implement. And as a teacher, I've discovered numerous hints to employ with my classes. Tutor in a Book contains an astounding number (a thrill for this uber-visual list-maker!) of worksheets and graphic organizer templates. Some kids don't need such things because their brains are naturally wired for organization, but I can't think of a single one it would hurt, even if they just fill it in mentally. They are detailed (but not overwhelmingly so) and specific; my personal favorite is the "book dissection" chart that helps students keep track of novel characters, ideas, & plotlines by chapter. My least favorite part is the series of 'case studies' throughout the book. Basically, they are 'real world' scenarios in which adolescents face school-related situations discussed in the chapters. I find them running a little long and being overly simplistic, with the characters resembling Disney Channel versions of preteens - savvy & sassy, with problems that can be solved and mindsets that can be changed within 24 minutes. But again, there is nothing harmful about such a feature since readers can skip those parts, and maybe some kids will actually enjoy them (like they do iCarly and friends). Not surprisingly, I appreciate the section on talking with teachers. It is practical - "not a good idea to appear at your teacher's desk days before an important test" - and genuine ("Even though they may seem a bit intimidating or even strange, [they] are a resource you should make the most of.") This is one of those things people tend to forget to teach kids - how to ask for help - and the authors give quick & simple instructions that will benefit students immensely. Overall, I found Tutor in a Book a top-notch resource for kids, parents, and teachers. It is easy to follow, utilizes an attractive & smart layout, and provides plenty of useful bullets & numbered lists as well as the previously mentioned worksheets. The voice Mayzler and McGann use is appropriately frank yet welcoming - they recognize common defeating student behaviors and kindly challenge kids to overcome them through the given strategies. I would love to have these ladies working with my students, but the next best thing is to keep their book on my shelf and employ it each day. Well you've sold me. I'm off to Amazon right now. Carlie hasn't started school yet. Middle school. Next week. I may be back with questions. Just found your blog having been a fan of coffeeyogurt for a long time. I do like your blog and being a psych who works in schools - as well as private practice, this is a great post and I'll look some more into this book. YOU? Are verrrrrrry good at book reviews.